Members of both parties expressed substantive concerns about how high-tech’s surveillance economy preys on privacy and elevates propaganda—followed by wide skepticism that Facebook and the tech sector can be trusted to fix these problems without new federal regulations. Zuckerberg repeatedly stated that Facebook has taken new steps to protect user privacy, impose transparency and disclosure standards for political advertisers, and would not oppose federal regulations, but would want to work with Congress to refine any new law. 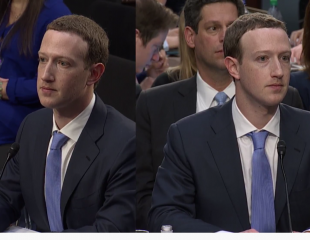 Despite his poise and focus answering questions, outspoken liberals and conservatives repeatedly told Zuckerberg he was dodging the toughest issues and noted that he didn’t follow his previous promises. The exchange between Hassan and Zuckerberg was indicative of the Senate hearing. It was part mortar-boarding, where Zuckerberg tried to school the senators on how his platform works, collects its user data, sells ads based on proprietary profiles, and has launched a series of new steps to prevent personal data being stolen, and its pages from being hijacked by extremists seeking to disrupt voting and elections in the U.S. and abroad. But the hearing was also part political water-boarding, where despite Zuckerberg’s answers, the senators grilled him with a variety of bottom lines. Like other senators, Hassan said Facebook's actions spoke louder than its words. Those actions included the Cambridge Analytica scandal, where that British-based political consulting firm stole personal profile information on 87 million Facebook users and then sold it to several GOP presidential campaigns. The senators understood Zuckerberg’s explanation that Cambridge Analytica violated its agreements with Facebook when it pilfered the data. However, they repeatedly said Facebook erred in not informing those 87 million people about the data theft—despite its public pronouncements and even a Federal Trade Commission consent decree concerning how it safeguards users’ privacy. Hassan replied that was helpful, but then asked if tech companies should face steep financial fines “when large providers, like Facebook, are breached, and privacy is compromised as a result. Because right now there is very little incentive for, whether it’s Facebook or Equifax, to actually be aggressive in protecting customer privacy.” That line prompted what was arguably the day’s most personal response from Zuckerberg. There’s much more than rebuilding trust on the privacy front before Congress as is considers how to respond to the Facebook-Cambridge Analytica scandal. There’s the issue of who owns their online information—individuals or platforms. Perhaps the thorniest issue—because the legal lines have not yet been clarified in law or court—concerns what Sen. Ted Cruz, R-Texas, and other Republicans, raised. Cruz attacked Facebook for not following the First Amendment, because it removed pages from right-wingers who he is aligned with, but Facebook judged to be partisan extremists. Other Republicans warned Zuckerberg that Facebook has be very careful with not appearing to take partisan sides. Beyond the hypocritical nature of Cruz’s attack, first because his 2016 presidential campaign hired Cambridge Analytica to sway voters (using stolen Facebook data), and also because Cruz knows that private corporations do not have to abide by free speech rights because they are not public entities, the argumentative Texan was highlighting a Facebook vulnerability. That’s because Zuckerberg has said his platform will not display lie-filled propaganda, hate speech, political bullying or anything that it judges to be violence inspiring or a public threat. However, as Sen. John Thune, R-South Dakota, noted, there often was a blurry line between “hate speech and political discourse.” Thune asked how Facebook intended to draw out that distinction—because as a private company its user agreements are not bound under the First Amendment’s political speech rights. Zuckerberg’s response was revealing for the short- and long-term. In the short term, he said Facebook would hire thousands of people across the world to review posts with an eye to removing outright propaganda, hate speech or violent threats. In the longer-term, he said artificial intelligence (AI) would screen content automatically and remove bad posts—but that was still several years away. That means beyond what Facebook may do to protect online privacy and personal information, as well the steps it is taking to force political advertisers to disclose their identities, that it will make mistakes in posting or censoring political information. That reality will surely lead to attacks by partisans of every stripe, including more calls for federal action—if Congress doesn’t proactively address these issues. Zuckerberg will testify before House members on Wednesday, where he will surely be asked about all of these topics, drilling down into how Silicon Valley’s attention economy works. Many senators implored Zuckerberg to help them fashion solutions. As Senate Judiciary chairman Chuck Grassley, the Iowa Republican, said at the end of Tuesday’s hearing, Facebook has tremendous political power. He urged it to avoid taking partisan stances and help restore public faith in government.